Here it is, the first true design diary for my first full roleplaying game, Death Rattle, Panegyric and Epitaph. In this series of posts I want to tell you why I’m creating this game, how I’m creating this game, for who I’m creating this game, and why I’m creating this game the way I’m creating it. Where do I start? I’ll start with the name. I’ve had the Spanish sentence “Estertor, panegírico y epitafio” (that is Death Rattle, panegyric and epitaph in Spanish) in my mind at least two years. I sincerely can’t remember where did I heard it, or when did I put those words together. I was initially planning on using it as a title for a mystery novel involving three whodunits with the narrative frame of a conversation between three persons related with the stories and with only the given names of Estertor, Panegírico and Epitafio to keep in secret who they were in each story. I have not totally forsaken this idea, and the first of the whodunits is progressing (it will be called John Merridew is dead), but probably the details and the frame narrative will be different. So, at the start of 2015 a new entry of the Rolero de Hierro (Iron Roleplayer) contest started. Rolero de Hierro is a mini rpg creation contest with a previously established theme and elements. In that occasion, the theme was death. I had the perfect title for a roleplaying game about death! Rules should allow any player to act in any moment. There should be rules allowing the players to change a DM sentence during the game. The game should fit in a sheet. I had the title and these elements. I decided the game would be about a recently deceased ghost looking for help from his or her living acquaintances. Any player would be able to act as the ghost in any moment (to fulfill the first element), and the ghost would grant narrative powers to the players to allow them to defy the DM (and fulfill the second element). To tie it all together, two additional ideas: there will be three characteristics, called as the game: Death Rattle, Panegyric, Epitaph; and the player characters and the ghost will be going through the five stages of grief: Denial, Anger, Bargaining, Depression, Acceptance. 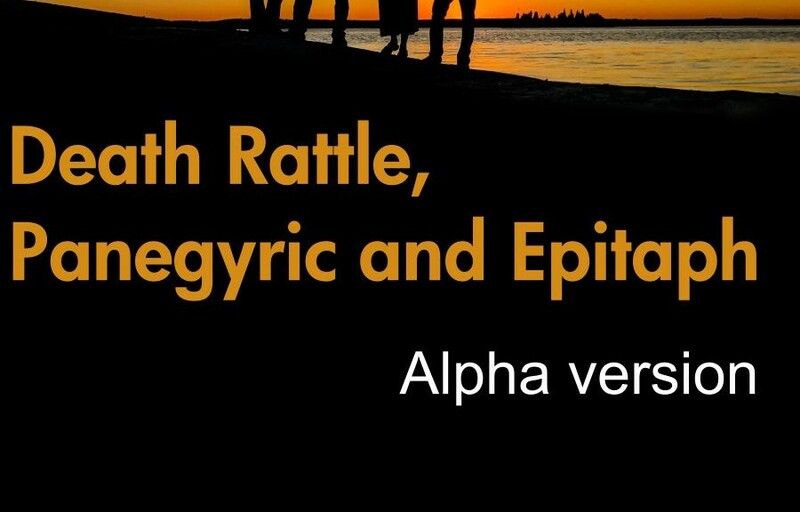 You can now get the alpha in-development version of Death Rattle, Panegyric and Epitaph from DrivethruRPG.!!!! I’ll be updating it for some time while adding to the alpha until having a complete alpha version, with at least all the main systems in it.